How Do the Fitness Yoga Balls Work? Fitness yoga balls provide support and challenge muscles with balance. If you've spent time in a gym or a yoga studio lately, you've probably seen them -- colorful, balloon-like fitness balls of varied sizes lolling around the mats or sitting in the corners. Maybe you've seen trainers using them in different ways for pushups or abdominal work. In the yoga studio, these yoga balls are used for deep stretching, sitting mediation or to modify poses. But what is the real purpose of these balls and how do they enhance a fitness routine? It's all about support and balance, which is why personal trainers gave them a third nickname: balance balls. Fitness balls come in a range of sizes, from 12-inches in diameter to 30-inches. It's important to use the right size ball for your height and to keep your desired air pressure consistent. The firmer the ball, the more difficult the exercise will be; the softer the ball, the less difficult. If you are a beginner exerciser, overweight or have balance problems, you may want to consider using a larger, softer ball. This means there will be less chance that you will bounce or roll off of the ball. If you do, don't sweat it, almost everyone loses their balance the first few times on a fitness ball. Physical therapists were the first fitness professionals to use stability balls. Even if you are relatively fit, it is common to have an imbalance between your core muscles and the muscles of your back. This is often what causes back strain and injury. Fitness balls aid in strengthening the core of the body because they engage the smaller, less commonly targeted core muscles such as the transverse and obliques. While you perform crunches, pushups or donkey kicks, the upper and lower abdominals, transverse and obliques, as well as the muscles of the back and sacrum, are all engaged in micro-movements that help keep your body balanced on the ball. The bonus? A workout on a fitness ball feels much less taxing than one done on the floor! Fitness yoga balls can be a supportive tool if you are a beginner yoga student or are struggling with low back pain or recovering from a knee or shoulder injury. If you're coming back from an injury, always consult with a certified yoga instructor and your treating physician before working with a stability ball. You can use a yoga ball for a modified Child's pose, a gentle twist or simply to stretch your back. Just sitting on a stability ball before a yoga session can gently warm up your muscles or help you achieve the correct posture for a sitting meditation. Once you're comfortable with the movements of the ball try experimenting with different poses and asanas, letting the ball support different parts of your body such as your neck, lower back or chest. 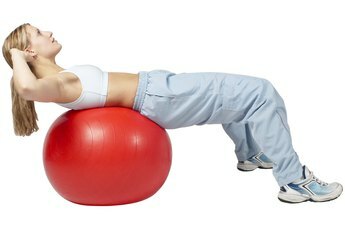 Guidelines for buying or choosing the right size stability ball correspond to your height. When sitting on the ball, your knees and hips should align at a 90-degree angle. If you are less than 4-feet, 6-inches tall, use a 12-inch ball; from 4-feet, 6-inches to 5-feet, use an 18-inch ball; from 5-feet, 1-inch to 5-feet, 7 inches, use a 22-inch ball; from 5-feet, eight-inches to 6-feet, 2-inches, choose a 26-inch size. If you're taller than 6 feet, 2 inches, use a 30-inch stability ball. 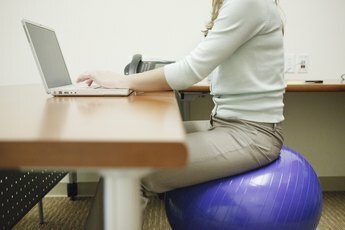 Do Sitting on Exercise Balls at Work Really Help?